Our first Santa Fe visit together was in 1994. We’d been dating for just over a year, and George shared with me his American haunts on a cross-country drive that summer (a drive we’ve repeated every summer since). 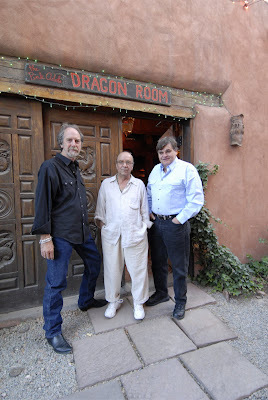 We walked into the Dragon Room Bar at the Pink Adobe early on a weekday afternoon. The room was nearly empty, except for a small woman at a round wooden table painted with dragons and planets and roosters. Sitting on the bench on either side of her were two large dogs, Gina Lollobrigida and Don Juan, drinking from blue glass bowls bearing their names in silver paint. The accomplished flamenco guitarist Ruben Romero serenaded the trio from a barstool a few feet away. Don Juan moved closer to Gina so that George could sit closer to Rosalea. I stood and waited. She ignored his introduction, and she ignored me, and I got the feeling that my presence represented Romain’s absence and so, before I’d even said hello, I was the enemy. We walked across the courtyard to The Pink Adobe, a restaurant housed in a three hundred year old adobe building. 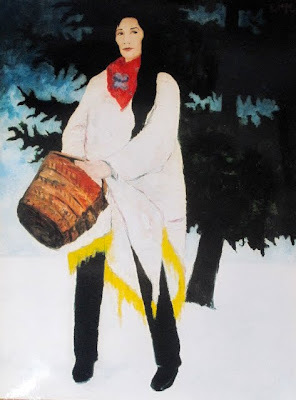 In the 1940s Rosalea moved to Santa Fe from her hometown, New Orleans, and sold hamburgers from a vending cart on the street (the Old Santa Fe Trail), using the money she made at lunch to buy the meat for dinner. Within a few years she purchased the building and opened her own restaurant, The Pink Adobe, where she became famous for her gypsy stew, chicken enchiladas, and apple pie. “What was the joke?” I asked. (This is a g-rated blog. If you’re over 18 and can’t guess the missing four-letter word that rhymes with rock and clock and hollyhock, then you’re out of luck. If you’re under 18, you shouldn’t be guessing). What looked like a price tag hung from the painting. George returned to the table, surprised to find us laughing and exchanging stories like old friends. I almost lost her that same night, however, when I asked about Georgia O’Keeffe. 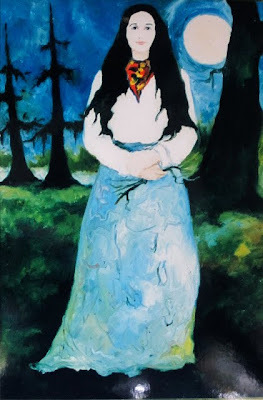 Rosalea disliked both O’Keeffe and her paintings, never understanding why anyone would care about her flowers and her skulls (as opposed to dragons and roosters, I suppose). She (along with many other notables) hung out at the bar at the Dragon Room. Rosalea cozied up to the presidents and male actors, but it’s a wonder that women still visited the place. She claimed to have thrown O’Keeffe and others out on numerous occasions for no reason other than that she hated them --- or, more likely, because they grabbed the attention of a passing man. 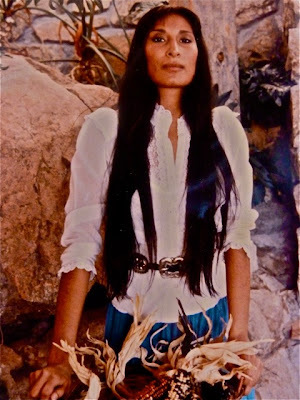 George told me later that he almost lost Rosalea too, when he approached Evergreen Lake at the bar during a visit in 1985 and arranged to photograph her the following day. 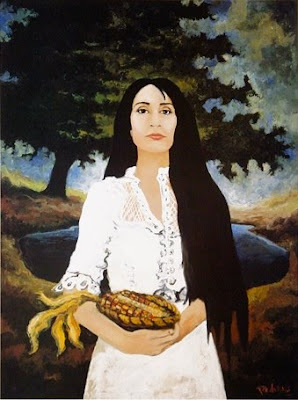 He saw a particular look in this beautiful young Indian woman, and although they never met again (out of respect for Rosalea), he used the photographs from that afternoon (below) in dozens of paintings over the years. Over the years we grew very close to Rosalea. Through her we met and became friends with several amazing artists, including Armand Lara and Doug Magnus, whose works appear in this blog, as well as Scott Wayne Emmerich of Falconhead boots (you might remember that George performed the gris-gris with his hand-made Mardi Gras boots a few weeks ago). It was special for me to witness these creative pow-wows, as Rosalea and ‘her men’ encouraged each other in the arts. Eventually George and Doug would collaborate on a collection of Blue Dog Jewelry. Beginning in 1995 we stayed for a week each summer in her apartment above the Pink Adobe, where we awoke to purple bedding and pink walls and five-foot sunflowers, all complementing the view of the Church of San Miguel (1610), the oldest church structure in America, and located directly across the street from the restaurant. If we happened to be in town on a Wednesday, we joined Rosalea and her merry bunch in the apartment for poker. It was then that I learned that I wasn’t the only woman in her life. As long as the men fawned on her first and the women understood their place, then they were welcome. 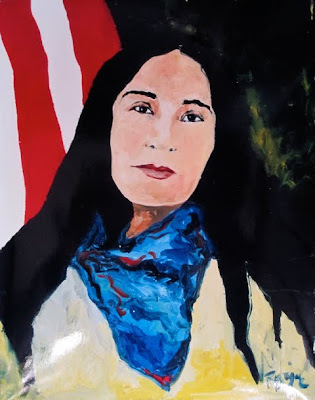 Her family, namely her daughter and granddaughter, were exceptions to the understanding, and they enjoyed her sustaining devotion and pride regardless of any unstated rules for the rest of us. 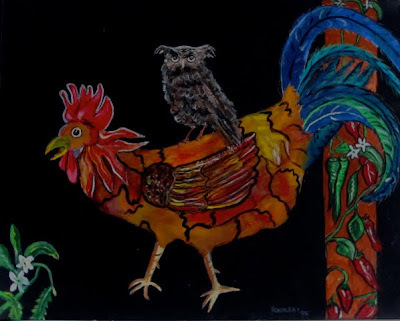 Rosalea’s daughter, Priscilla Hoback, is also a remarkable artist. 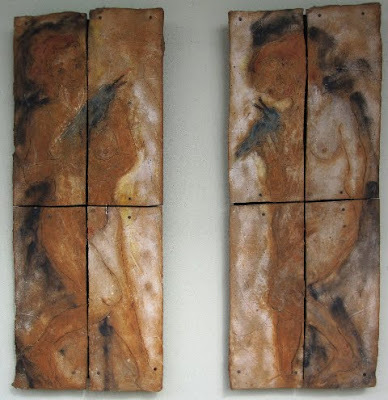 George and I especially enjoy her works in clay, like Adam and Eve, pictured below, which hangs in our courtyard. 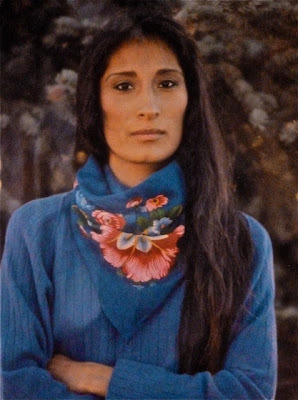 Rosalea Murphy died in 2000. She was buried wearing her “R” and “M” earrings, made by Doug Magnus, along with her custom made Scott Wayne boots. 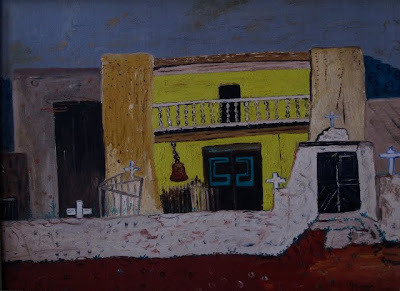 George and I still struggle to visit the Pink Adobe, often avoiding it in fact, because the popular restaurant and bar (now run by her grandson and his family) seems empty without Rosalea and her dogs. 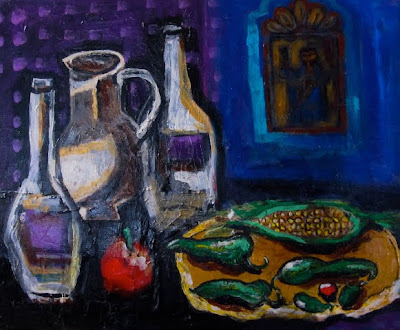 We pay tribute to her with the four paintings in our collection (including the ones pictured in this blog), as well as a prized painted table and large pots of sunflowers in the summer. On those rare occasions that we do stop into the Dragon Room and visit with ‘Rosalea’s men,’ I remember my place, hanging back a bit, watching these talented artists as they visit about old times, current projects, and especially the strong woman who loved them and brought them together. 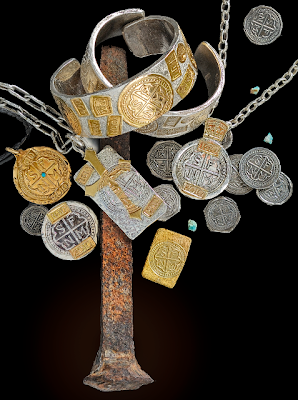 For more on Santa Fe and the artists mentioned here, see the story Land of Enchantment. Wendy, I "friended" you on Facebook because as a former New Orleanian and Lafayette wannabe, I've loved the Blue Dog since the eighties. However -- and no offense to George -- your blog is Internet artistry unto itself! Well thank you, Stephanie! You've certainly started my day off right and given me just the right motivation to begin work on the silkscreen blog --- something I've been putting off for weeks, preferring to tell stories and write about the Saints! What a delight to read your blog and "meet" Rosalea, whom I'd never heard of before. She must have been one special character! I've followed your husband's work since the mid 80's and love it, and have been to the Blue Dog Cafe in Lafayette many times. Keep on writing...very prolific and enjoyable! I have been browsing the web today and luckily came across your blog. 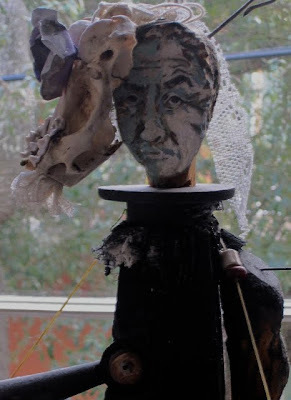 Just posted one of my favortie New Orleans artists on my blog! Enjoyed reading your Santa Fe story. Love how you respected and yet stood up to Rosalea; many women would have been put off and maybe jealous of this kind of situation. You were clearly the better woman and it worked to your advantage. 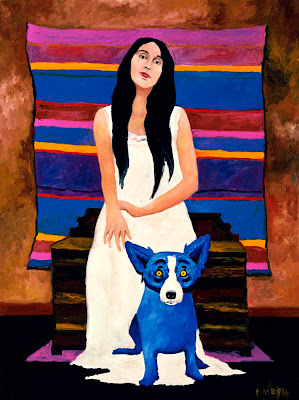 Have always loved the blue dog, love all things NOLA, it is my birthplace. Thanks for your interesting stories. 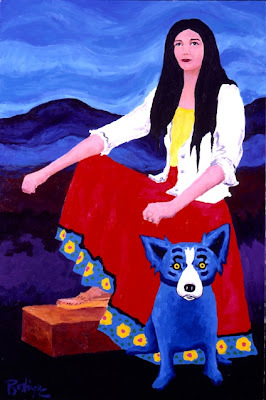 Love those paintings... And the BLUE WOLF DOGS...! AND THE ROOSTER...! Really nice work! Really enjoyed this article. I opened the first Cajun restaurant in NM in `85, the Lone Wolf Cafe. I met George shortly thereafter and introduced quickly him to my best pal, Rosalea Murphy. Have missed seeing George through the years; we had some "heady" times in Santa Fe in the `80s, really the last cultural hurrah in recent Santa Fe history, before the mind numbing onslaught of Califorians, the seeingly endless line of realtors and the multitude of homogenous, Lexus-driving soulless robots. I need to take issue with you on one thing in your piece: Rosalea dropped what I called the "evil eye" on just about everyone, not just women. Granted, she loved her boys; however, she loved women as well, if they were thick-skinned enough to handle the "eye;" meaning, man or woman, you had to show you were something more than a pretty package to gain her respect. You needed an endearing quality: wit, intelligence, joie de vivre, artistic bent, etc. Survive the "eye," you were in, and might be actually be invited to a seat at Table 10! Tell George I said, "hey." This is a great profile of a wonderful character and unique persona, Wendy. Thanks for posting about her. Your courageous first conversation capped by purchasing her painting sounds like you hit on the winning combination to pass the initiation. Good for you! Thank you, Nancy. Rosalea was one of those rare most wonderful people in a lifetime. 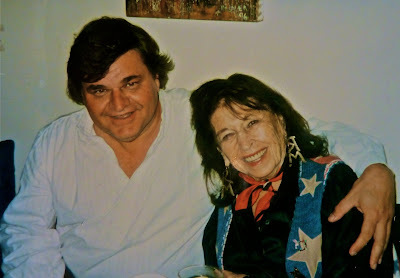 George and I miss her terribly --- this summer especially, as we forego our usual Santa Fe visit. Thank you - I so appreciate each and every character that I've met through your writings. This was one of your absolute best. You have a way of describing each person and place so that they become my old friends as well. I remember George from the way back at the Festival Acadiens et Creole but have a renewed interest in the whole Blue Dog works thanks to meeting you through your travels and descriptions! Thank you, Mariana! What a lovely message, and the perfect inspiration, as I put together this week a tribute to those wonderful, complicated characters----- our mothers! 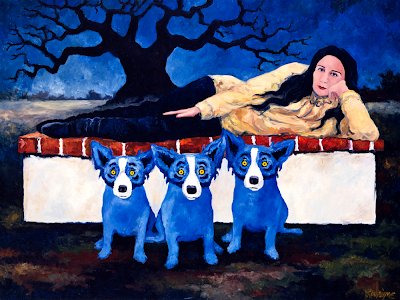 We will always cherish our signed copy of Blue Dog Love that we received from you and George during the signing at the gallery in New Orleans...as we do our three Blue Dog's. We shared our story of God Bless America and the 9.11.11 story tonight with friends while at Pink Adobe. It was emotional. Our thoughts are with you. We miss Rosalea and George and thinking of you tonight. Loup Garou...what goes around comes around! It's been a pleasure reading your blog. I have such fond memories of the Pink Adobe, and loved meeting Rosalea Murphy through you. The photo of her on the motorcycle is a revelation! 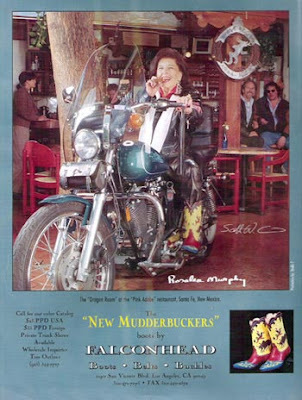 I wondered if one of the two men sitting at the bar behind her in the ad was Douglas Magnus. I look forward to reading more of your musings! Thank you and all the best. Thank you, Wynsum! Yes, Douglas Magnus sits at the bar with Scott Wayne Emmerich of Falconhead Boots!